Fans discuss the latest Superman movie “Man of Steel” in the Comics Club’s first ever event. 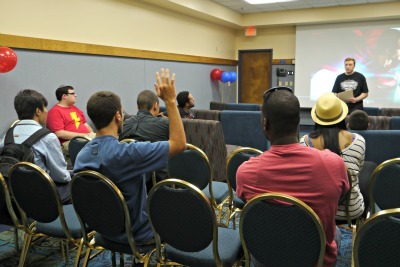 No, it’s FIU’s new Comics Club, which hosted its first ever event on July 2 centered around one of the most beloved and well-known comic book characters of all time: Superman. On the heels of the release of “Man of Steel,” starring Henry Cavill as Clark Kent (a.k.a Superman) and director Zack Snyder at the helm of the reboot, having a Superman Fan Night only seemed like a fitting theme for the club’s first major event. More than a dozen fans gathered in one of the Wolfe University Center’s conference rooms to discuss the new film while snacking on fresh popcorn. They touched on everything from producer Christopher Nolan’s influence on the film and Amy Adams’ portrayal of Lois Lane to the reactions of audiences in the theatres and comparisons to other versions of Superman. Despite a wide range of opinions on the film itself, there was one general consensus that was agreed upon. “It’s good to have Superman back,” said Fernando Ottati, a graphic designer for Campus Life and Comics Club advisor. Fernando Ottati delivers opening remarks at “Superman Fan Night”. 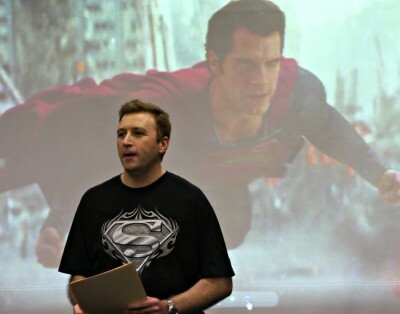 Following the discussion, the club’s secretary Alex Jaffe talked about the history and evolution of the character of Superman over the years, beginning with his comic book debut in 1938, as a lead-in to a screening of Richard Donner’s “Superman II” starring Christopher Reeve and Gene Hackman. The appeal of Superman throughout the decades comes as no surprise, and the portrayal of the character in “Man of Steel“ and other versions show that there is a lot to admire about the character itself, especially for college students. The event was seen as a very encouraging start for the club, which is looking to foster a community that can come together and discuss the wide world of comic book heroes, villains and everything in between. In less than a month of becoming an official club, it already has close to 30 members and is looking to boost those numbers when the fall semester begins. Some of the club’s members will be going to Florida Supercon, which runs July 4-7 and is one of the biggest comic book conventions in the state, and the club is hoping to attend other conventions and events in the future. Jaffe would like to get speakers from the comic book industry to speak at events either live or via teleconference, have events where members can trade and showcase their own personal comic collections and to have more screenings of films taking comic book characters and bringing them to life on the big screen. For more information on the FIU Comics Club, send an email to fiucomicsclub@gmail.com or visit https://orgsync.com/69252/chapter. Thank you on behalf of our new Comics club. That was a great article read and I’m glad you enjoyed our event and obtained some really great information. Thank you to FIU news and The Beacon for covering us the past couple of days. Comics Club is open to everyone whether you collect, or a fan, or just starting, everyone is welcome. My only complaint is that we seen the origin story what, three times now in movies and TV? Enough already! We know how he came about. Now let’s concentrate on his adventures. I agree! They tried doing that with the Lois & Clark show, but they should do it again!